The beginning in what was to become one of the greatest adventure games in the computer industry. 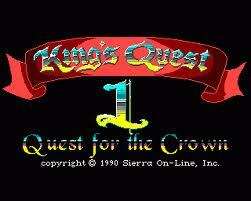 Kings Quest 1: Quest For The Crown was first released in 1984 and commissioned by IBM as a showpiece for their PCjr, and was the first game to support EGA color cards. Story line: The King of Daventry is nearing the end of his life. Tragically, he has no heir to carry on the royal line, and he worries that his kingdom will be left without a leader. Daventry is already a shadow of its former glory, as the three treasures of the realm have been lost to the ages. And so the king summons his bravest knight, Sir Graham, and sets him on the quest - return all three of the lost treasures, and the throne will be his. Not an easy task, but the recovery of the Mirror, the Chest of Gold, and the Shield will take Sir Graham through mythical perils and magical dangers, and forge a new kingdom from the ruins of the old!